Included is a pix of my Mac 128K. I did a demo of at Apple's Millennia Mall in Orlando, FL. Lots of oooohs and ahhhs from the Geniuses and the crowd of Apple customers. Note the original March '84 magazines: original Macworld, vol. 1, Byte, Personal Computing, etc. The Mac is 128K original, manufactured in Fremont in March '84. I bought it opening day at Harvard Bookstore in Mass. Months later my wife bought the ImageWriter (original) and then later the 400K floppy. 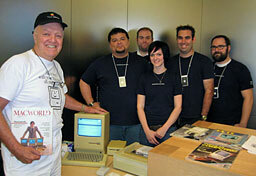 I owned an Apple Service Center (Macspert) in New York for 17 years, so I know the Mac is in perfect working condition. I printed MacWrite and MacPaint documents in the store from a 10-12 year old printer ribbon in great condition. Ooooh and ahhhh. What the above photo might look like on a 9" b&w Mac. We're very excited that the Macintosh turns 25 in January - expect a lot of coverage. We're planning to publish a Top 25 Macs list, among other things. As for the value of your Mac 128K, I couldn't say. We don't pay much attention to the collectable market, and value will depend on whether or not you have the original box, carrying case, disks, manuals, etc. No idea what the market will bear. I've played a bit with your photo in Photoshop to emulate what it might have looked like dithered for use on your Mac 128K - enjoy. Hello! I am sure you get a ton of email about this, but I will try my lucky. I have an opportunity to purchase two low end Macs. One is a Apple PowerPC 7200/120 the other is an Apple Macintosh Performa 631 CD. My question is can these be upgraded easily and cheaply to do video and photo editing as there main chore? It's a definite maybe with the Performa, as Apple sold the Apple Video System card specifically for importing video. The big drawback is that it only supports 320 x 200 resolution. That's not completely horrible, and you may find it adequate for importing from VHS. Apple also made a Apple Video/TV System which added a TV tuner to the mix. Neither are particularly easy to find nowadays. While this may be a great way to import low resolution video, you probably won't find the Performa's horsepower satisfactory for more than the most rudimentary video editing. The only practical upgrade would be to replace the 33 MHz 68LC040 CPU with a full fledged 33 MHz 68040 CPU, which would speed up video processing. As the Performa has no support for USB, there's no practical way to get digital images from your digicam or flash memory card into the computer. The Power Mac 7200 will accept a USB PCI card with Mac OS 8.5 or later, although it only supports USB 1.1 speed. Any USB card reader should work, and Photoshop (versions 3 or 4) should run nicely on it; Photoshop 5 and later require a G3 and will not run on the 7200. The only CPU upgrade ever sold for the 7200 was the Sonnet Crescendo/7200 G3 500 MHz, which used to be a horrendously expensive device (the 400 MHz version sold for $499 and $599 depending on cache size). Fortunately Sonnet is blowing these out at just $40, so you can gain 4-8x the performance at minimal cost. I know there were video input cards and TV/video cards for those old PCI Power Macs, but the only one I had any experience with was the ixMicro ixTV, which worked very nicely in my SuperMac computer. No idea how easy they are to find nowadays, but I couldn't find any listed on eBay or the LEM Swap List. You are indeed right that some configurations of the iMac G4 and the Power Mac G5 came with 256 MB of RAM; I did not take that into consideration. Sorry! iLife 05, VLC Media Player, AppleWorks, iWork, and Preview all work fine. So do heavier Core Animation programs such as Time Machine and Cover Flow. As Dan said, my needs are indeed quite modest. From using a Lombard and 667 MHz PowerBook G4; the Digital Audio is a huge step up. I'm not a heavy Mac gamer; apart from a few games of Return to Castle Wolfenstein now and then, I do all my gaming on an Acer Aspire notebook. RTCW works fine on the DA, by the way! I find 512 MB of RAM to be sufficient in Leopard; on my 800 MHz eMac it was (though I upgraded to 1 GB later). But, once again, my needs are quite modest. Just to let you know that I've successfully installed Leopard onto a Pismo with a G4 550 upgrade, 1 GB RAM. using Pacfist. This has made scrolling much better in Safari as well - but not solved any screensaver loading issues or enabled CoverFlow in iTunes. I've yet to fiddle properly yet with the kexts for the battery bay, which the left one doesn't report back any information. However the right ones does report back all information correctly. if I ever get around to it, I'll post benchmarks and maybe try some old games. the guide on the site was extremely helpful, only had to use a different site in order to find out how to construct the single layer dvd. type sudo killall -HUP gdm and watch what happens! Up pops the Xubuntu mouse on screen and then the GUI and boom! You are set. Thanks a million! I now have Xubuntu up and running on my 400 MHz iMac. The blue theme looks much nicer than the brown used by regular Ubuntu. I've visited several websites in Firefox, and everything looks good. It's not speedy, but I'm sure part of that comes from running off the CD and not being able to cache files to the hard drive. Next project: Back up the iMac's hard drive, partition it for Linux, and do a full install to the hard drive. The LiveCD does not set up xorg.conf correctly for the iMac G3. The fix, after you get to that blank screen, is to drop to a shell prompt and edit xorg.conf. Modify "HorizSync" to 58-62 and "VertRefresh" to 75-117. Both are in the monitors section. Disable DRI (in the modules section, put a hash mark (#) at the beginning of the line containing "load dri"). Hi Dan. Thank you for your wonderful articles. I've been a Low End Mac fan for about 10 years now and hope LEM continues spreading the retro-Mac love for many years to come. I've recently been following the LEM Mailbag on the topic of GNU/Linux on the PowerPC (or "Linux/ppc" for short) for some time now, and I've yet to get the memo on the death of Linux/ppc. It seems that the death of Linux/ppc has been greatly exaggerated, mainly on some misconceptions of what "unsupported" means. Canonical (the company behind Ubuntu) has announced that it would not officially support the PowerPC platform as of 6.10. Like many others, I was worried about what the future would hold for the PowerPC port of such a great GNU/Linux distribution. However, as time progressed I noticed that my worries were all for naught. Canonical's announcement only meant that they would not handle the continued development of the PowerPC port but would instead leave it up to the Ubuntu/ppc community to maintain currency with the official releases. To my fortune, this turned out for the best. The Ubuntu/ppc community has managed to keep in pace with the official ports, maybe falling behind by a day or two. Even the Fedora Project has left it up to the community to maintain a release of Fedora 9 for PowerPC, and the improvements are definitely showing. The hardware support has also gotten much better since it's been community-driven. I noticed that with 7.04 and subsequent releases that my iMac G5 finally gained the proper fan and thermal support that was lacking in 6.10 and previous versions, causing my iMac G5's fans to go full-on and full-off in intervals. I also noticed a significant speed increase from 6.10 to 7.04 and even with 7.10. About the only thing I still couldn't get working right was my Bluetooth keyboard and mouse, but that wasn't a major concern for me at the time. I have not yet tested with 8.04 but will soon. And speaking of things not working, you mentioned that there is no support for the Broadcom chipsets in the AirPort Extreme cards. This is not true. As a matter of fact, the Broadcom chipset has been supported natively for some time now under GNU/Linux. The only caveat is that you need a package called bcm43xx-fwcutter to acquire the firmware to activate the chipset and expand it for use, which means you either have to download it manually or install it from the repositories using the ethernet connection on your iBook/PowerBook. Fortunately, once you install that package, the package manager will ask you to download the firmware from a preset URL and will configure everything for you. To take it one step further, the Restricted Drivers Manager (a.k.a. "Hardware Drivers Manager" in 8.04) does all the work for you to the point where you don't even have to launch the package manager and search for it manually. The PowerPC FAQ on the Ubuntu Wiki has more information on how to get that up and running, as well as other general information to consider when installing Ubuntu on PowerPC. If you are going to install Ubuntu, I definitely recommend using the Alternate Installation ISO images over the Live CD. Even on x86, the Live CD tends to give a less-than-stellar installation experience. The Live CD is great when you want to get an idea of what running Ubuntu is like on any platform. However, because they've included a live desktop environment in the CD, the Ubuntu team had to sacrifice a lot of features that are normally found in the Alternate Installation. And while the Alternate Installation is not as pretty or mouse-driven as the Live CD installation, you get a lot more options during the installation process along with all the automated configurations and hardware detections. At the very least, it's about as difficult as installing Windows XP on a PC (although the Alternate Installation is much more versatile than any Windows installation process). Everyone that I've spoken to that has had a bad experience installing Ubuntu (regardless of the architecture) has told me they've used the Live CD. After recommending them to the Alternate Installation, I have yet to hear from them about post-installation problems. Give that a try and see if things pan out better for you. And if you still have problems, there's always the old reliable GNU/Linux distribution: Debian. There is not one working system that I've come across that Debian could not install on, even on the x86 side! Debian also has a lot less overhead than Ubuntu, which makes it a nice choice for Old World and earlier New World Macs. Plus, their debian-installer (which is what's also used in the Ubuntu Alternate Installation) now includes a graphical option for those who fear text-based installations (just type "installgui" at the prompt, although I fear this is not an option on Debian/ppc). And while there might be some concern for PowerPC support waning even on Debian, consider the following: Not until Debian 4.0 "Etch" was support for 68K Macs dropped, and that was only because it failed to meet the release criteria (http://www.us.debian.org/ports/#released). That's roughly ten years since Apple discontinued the 68K Macs. With that kind of track record, I have no doubt that the same would be the case for more modern computers running PowerPC. For the record, I've been using Apple products for about 20 years (starting with my Apple IIc), Macs for about 15 years (though my first intro to a Mac was with a Plus in the late 80s, at which I was blown away), GNU/Linux for about 12 years, and Linux/ppc for about 6 years beginning with Yellow Dog Linux. And with great resources like Low End Mac, I hope to continue making them all a part of my computing experience for a very long time. Thanks for writing and sharing the wisdom you've acquired over many, many years with Macs and Linux. You're not the first to recommend Debian, and it's probably what I'll end up installing on my 400 MHz iMac. We are working toward developing an incomplete guide to Linux and BSD for older Macs, which will list the distributions that support Macintosh 680x0 and/or PowerPC hardware, include a link to the page listing supported software, and hopefully grow into a set of articles where our staff shares its experience with Linux/BSD on whatever hardware they've tried it on. The plan is for this to grow into a good introduction for newbies that will help them choose the distro and desktop that are likely to work best on their aging Macs to meet their needs. Long term project, but then that's exactly what LEM has been. Good luck with your Linux adventures. I've tried many of those that you listed and settled for the LTS version of Xubuntu 6.06 (with Xfce desktop) for my PPC LiveCD adventures. I find it less sluggish than either Ubuntu w/Gnome or Kubuntu w/KDE on my 867 TiBook. I've tried 7.10 but found it way too buggy. I tried the latest 8.04 in Ubuntu form, which I again found sluggish, but I wasn't able to find the Xubuntu version (which I again would expect to be more responsive) and so I've stuck with Xubuntu 6.06.1 for the time being. But I find the choices of Linux for PPC rather limiting. None of them would be my first choice for a LiveCD or installed distro on an x86 machine, but those are really the only choices available for a PPC Mac unless I want to build my own (like Gentoo or from ROCK or LFS). Perhaps these are more trouble than they are worth. All told, I tinker with Linux much less on PPC than on x86 simply because I find more options that I prefer on x86 (Puppy!) - and I'd choose *BSD over Linux if given a choice between the two. Furthermore, MacPorts allows me to do much of what I could with *BSD or Linux without giving up an of my Mac OS X positives. I agree that it might be nice if Apple offered a more tailorable experience, but in general I have been very pleased with Apple's approach. Hearing many complaints from folks who've tried Vista on relatively recent machines that met or exceeded the "minimum requirements", MS really didn't have a choice but to offer a lower mode for Vista. I use XP on a Core 2 Duo machine at work, and it cannot touch Mac OS running on my wife's MacBook Pro. XP feels slow compared to the Mac OS when run on comparable machines, and Vista feels a lot slower on the same hardware. Apple's OS is so efficient, it runs quickly enough on a lot of older hardware without a lower mode. My hat's off to Apple. I've had the pleasure of installing sequentially, one right after another, multiple OSes on a G3 iBook 600 MHz: Mac OS X 10.3, Mac OS X 10.4, Gentoo Linux, Ubuntu Linux (yes, the Gnome version. I hadn't discovered Xubuntu at the time), and NetBSD. I tried several window managers and desktop environments for the Linux and NetBSD trials, with the exception of Ubuntu, which I did not modify. For each of these, I measured the boot time and the amount of RAM used at idle and the time to launch some multiplatform applications like AbiWord and OpenOffice. And that is when I developed much greater respect for Apple and their OS. Except in the most extreme cases (like using a trivial window manager on NetBSD instead of a full up desktop environment) Apple's OS booted faster, launched applications faster, and used less RAM than any Linux, by a wide margin. Even with a stage 1 Gentoo install, compiled a stripped down custom kernel, optimized for a G3 with the recommended flags, the Mac OS beat it in terms of efficiency, hands down. NetBSD was a lot closer to Mac OS, but it also did a lot less out of the box than the Mac OS. Add those features back in to NetBSD, and even that couldn't quite match the Mac OS, but it was a reasonably close second. I didn't keep any records from my tinkering, and I've since given my iBook G3 to my dad to handle his music duties, but I think you get my point: Apple has surprisingly good performance on older hardware when compared to the Linuxes and *BSDs running on that same hardware, so a "lower mode" is really not required. I think Apple gets it right without having multimode support, and that's without even account for the quality of the Mac's level of integration. But don't take my word for it. I suggest you try what I've suggested and try a couple different options on your iMac and see if your results are anything like mine. For me, it was a real eye-opening experience. If you do, I'll be curious what your results show. Thanks for sharing your discoveries. I finally have Xubuntu running on my iMac, thanks to some reader tips on how to configure things. It's no speed demon, but I just wanted to see that Linux could run before I went to the hassle of backing up the hard drive, reformatting for Linux, and then installing (probably Debian). I've heard a lot of good things about BSD and may give that a try later on. I'll keep our readers posted.